China’s Lalho Dam Project: Should India worry? “The next world war will be over water” – Ismail Serageldin, World Bank Vice President. At a time when there is ongoing tension between India and Pakistan over water-sharing (read Indus Water Treaty), China too is adding up pressure. Chinese Dams and Hydro-electric projects in Brahmaputra is becoming an increasing concern for India. 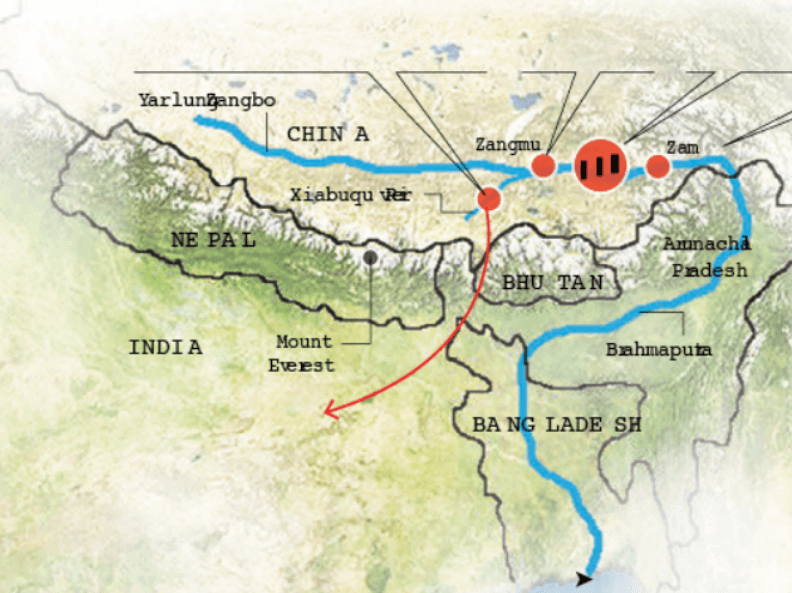 China is constructing their “most expensive hydro project” – Lalho project – in a tributary of river Brahmaputra (known in China as Yarlung Zangbo). The Brahmaputra, one of India’s major rivers, originates in Tibet (China) and flows into India (Arunachal Pradesh and Assam) before going into Bangladesh. The Construction of the Lalho hydroelectric project originally began in June 2014. This Project involves an investment of 4.95 billion yuan (USD 740 million). The Lalho project is planned at Xiabuqu river, a tributary of Brahmaputra, at Xigaze (Tibet Autonomous Region) in China. Xigaze also known as Shigatse is closely located to Sikkim. From Xigaze, the Brahmaputra flows into Arunachal Pradesh. Lalho Project will serves multiple purposes, such as irrigation, flood control and power generation. The Lalho project is likely to be finished by 2019. China’s Lalho Dam Project: Why in news now? China was blocking the Xiabuqu tributary (195 km long). Xiabuqu starts in Tibet and joins Brahmaputra at Xigaze. The project can impact water flows in India. 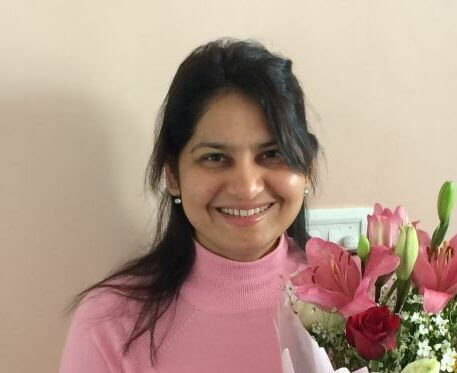 India is commissioning a study to ascertain how much the Yarlung Zangbo, actually contributes to flows in India and how much comes from the catchment area in India itself. Many experts estimate that the Tibet contribution is not more than 40 percent. The river’s mean discharge is 25.8 cubic meters per second (cumecs), less than 0.15 per cent of the Brahmaputra’s mean discharge when it enters in India. The reservoir was designed to store upto 295 million cubic meters of water. India is concerned that if the waters are diverted, then projects on the Brahmaputra, particularly the Upper Siang and Lower Suhansri projects in Arunachal Pradesh, may get affected. The dam may impact the flow of silt as well, which is essential to build up North Eastern Plains. China has been maintaining that it has taken into consideration India’s concerns and allays apprehensions of restricting the flow of water, saying its dams are run-of-the-river projects not designed to hold water. India and China have had several rounds of talks on the water issue since 2007 and Beijing has always attempted to play down New Delhi’s fears that it could use strategically positioned dams to regulate water flows into India. India has been taking up the issue with China for the past few years. And based on the understanding reached in 2013, the Chinese side agreed to provide more flood data of Brahmaputra. Some experts say that, the Lalho project may not reduce water flow to India in the long run, but it may add up to desertification in Tibet and Xigaze region itself. The Lalho project is well upstream of the “great bend” made by the Brahmaputra shortly before it enters India. Other tributaries joining the Brahmaputra in and around the great bend double its water flow before the Arunachal Pradesh border. Larger tributaries join the river in India, so that it carries eight times more water when it exits the country than when it enters. China’s first dam on the main upper reaches of the Brahmaputra was built at Zangmu in 2010. Later in 2011-2015, the approval for three more dams at Dagu, Jiacha, and Jeixu (small-scale projects) were given on the river Brahmaputra, in Tibet Autonomous Region. 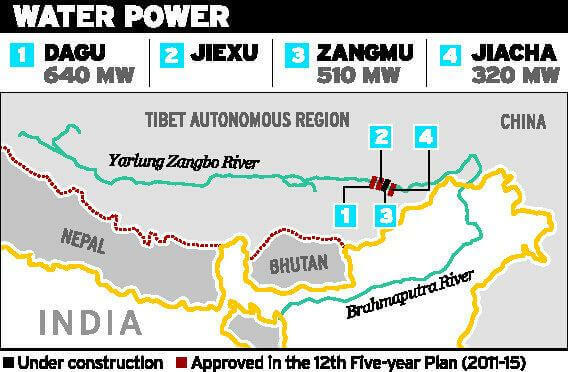 In 2015, China operationalized the largest hydel project in Tibet, Zam Hydropower Station, built on the river Brahmaputra. What is Zam Hydropower Station (Zangmu Hydropower Station)? China has operationalized $1.5 billion for the Zam Hydropower Station (2015) which has ignited concerns in India over the likelihood of disruption of water supplies. The dam has also raised concerns in India over China’s ability to release water in times of conflict, which could pose serious risk of flooding. The Zam Hydropower Station, considered to be the world’s highest-altitude hydropower station and the largest of its kind, will produce 2.5 billion KW-hours of electricity a year. No water treaties between China and India! There is no water treaty between the countries, but the countries has devised an Expert Level Mechanism (ELM) on trans border rivers. During the visit of the President of China to India in November 2006, it was agreed to set up an Expert-Level Mechanism to discuss interaction and cooperation on provision of flood season hydrological data, emergency management, and other issues regarding trans-border rivers as agreed between them, under which Beijing provides data to India on the water flows. 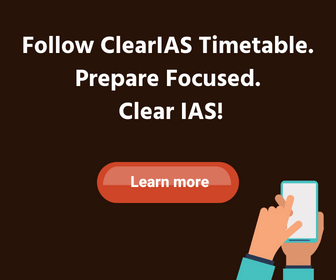 The Expert Level Mechanism from Indian side is led by Commissioner, a Joint Secretary level officer. Regarding the Lalho Project, if it is designed as a run-of-the-river project as stated by China it is unlikely to affect India’s interests in the long run. But India needs more clarity and data regarding Chinese Hydro-electric projects. Expert Level Mechanism has a greater role to play in water disputes. Water resources experts in India say that hydro power projects on Yarlung Zangbo have the potential to sweep away highland settlements and forests and bury the lowlands in silt. A case in point is the 2001 disaster after an artificial dam in Tibet gave away to kill 26 people and damaged property worth Rs 140 crore along river Siang in Arunachal Pradesh. A single dam alone is unlikely to be dangerous, but release of excess water from all dams simultaneously will be devastating. Ministry of Water Resources, Government of India.